I often get asked ‘how do you go about designing logos’. So here I want to write a quick article about how I go about designing logos for any company. It goes without saying every company needs a logo and they definitely range from the absolutely dreadful, completely wrong to the quite brilliant. The scope for failure is quite broad. Equally, the scope to get it right is quite narrow. So here goes . . I first of all make sure of the name and exact wording for the logo. I do this by sending out a briefing sheet to the client. This information will give me all the insight I should need without pestering the client with multiple questions. So I get it all in one written document. The questions I might ask are. Please explain the reasoning behind your choice of company name? What colours or type style would you prefer? How and where will you use the logo? Please supply any company service or product information? I like to research the sector the company is doing business in. This is important, as very often sectors have branding styles and colours that represent the businesses really well. For instance, pink might not be a great colour to suggest for an insurance company. Although putting in a wild card option to the first set of visuals is always worth a punt. This can open minds and discussion and means you are not just delivering the expected. Usually I find my clients have a pretty clear idea of what they are expecting to see. Now I start making thumbnail scribble ideas. I look at the logo name. Is there a visual theme here I can cross with a typeface or graphic trick. I designed a logo for Morgan Probate recently where I made the ‘M’ into a look-a-like church arches. It worked well. Can I make an interesting icon from the initials? With this you can make the cross over from letters to shapes. I did an interesting interpretation with Access Underwriting a Christian Insurance company. The ‘A’ and ‘U’ gap created a cross. Would a character work well or an illustration? Should the logo be in a line or circle? Can there be a graphic image? There are so many options. 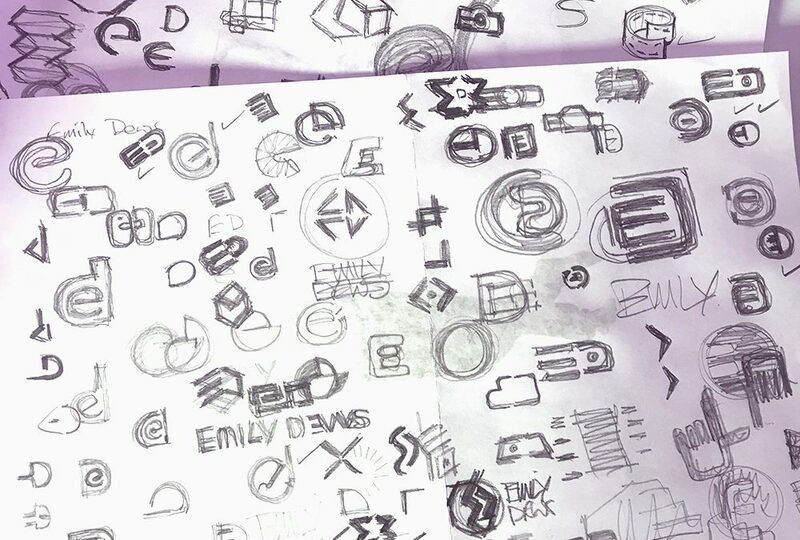 The picture shown was from some rough sketch thumbnails I did for Emily Dews Photography new logo. The client request was to create an image with Emily’s initials and turn these into a camera. The final draft achieved that very impactfully. So I have filled several A4 paper sheets with visual ideas. Now I am ready to choose 4 or 5 ideas to work up in Adobe Illustrator. Using Adobe illustrator means I can, at this stage, use the tools in the software to experiment with shapes and typefaces. I created a logo for Willetts Farm Ice Creams where I combined the ‘W’ and the ‘F’ to create a very individual and striking icon. Have a look in my portfolio on the site to see some of these samples I have described in this blog. I also combined an arrow into an ‘A’ for Actuate personal training’ too. Before you present your ideas you must have an overview of what you have created. Read back the brief to make sure what you have designed is on brief. For instance, each logo concept must be distinctly different yet all must sit inside the sector you are designing the logo for. Logos are very often several elements placed together and it is how you control these elements when placing them that counts for the final effect. The colours, the choice of typefaces, the shapes you incorporate all matter to the final look and feel. The great thing about designing logos is that anything is possible, you have a blank canvas and it is really all about narrowing down your options and not broadening them. Don’t be daunted by the task. The best logos have depth-of-thought, are eye catching and represent the brand, service or product. But most importantly keep it simple! If you can’t create what you want, please talk to us first. For more information on having a logo designed please click here. Logos are designed preferably in Adobe Illustrator or another vector software. The reason for this is that in the future the logo might need to be used at multiple sizes and media. On banners, on-line, on business cards, brochures, or signs. Vector software means your logo is designed in a file that allows multiple sizes without losing quality and sharpness. These are the preferred file types for printers too. Don’t waste your money, talk to us first. The Graphic Design Shop UK is a subsidiary of Paul Gurney Communications Limited. Company number 4762263.